Anneka Ever is a romance author. against the beautiful backdrop of rivers and forests. America. She lives in Virginia with her husband and three dogs. wild greens, and corn bread. Rings at least once a year. their field if it’s pertinent to my book. two adversaries come together, they are swept away in a flood of passion. June, and, An Oath Sworn – 23 December, 2015! writing ahead and meeting the amazing people who will share this journey. Q: Describe the perfect vacation. and write of my day’s experiences or work on a new novel. Q: Tell us about your favorite toy as a child. played with them outside and would create stories about their antics. pleasure I love medieval romances and romantic suspense. a timetable that I use for my story. irresistible. And he, too, is intolerably Scottish. wedding—even if they must kill the bride in the process. media contacts for the author. 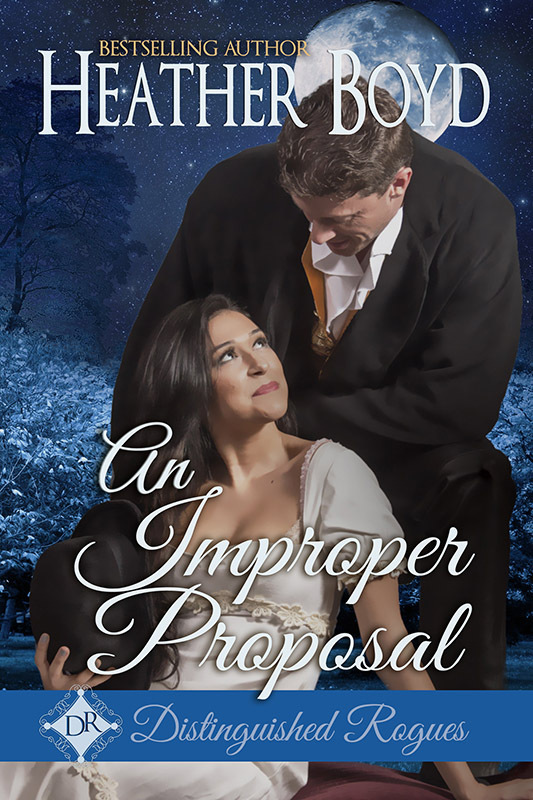 Today’s featured book is An Improper Proposal by Heather Boyd. private lessons in the duties of a mistress. Book 1 answers five easy questions to help readers get to know her better. Diane gave it all up when her husband said “follow that dream”. for the sake of eating. tasty seafood risotto or a creamy tagliatelli. still one of my most precious possessions. information on Black Hawk helicopters, their pilots and training. find a way with patience and faith on planet Earth. just a simple human being to get past Ginny’s defences. get Matt alone long enough to let him appreciate her pyrotechnics? of Desire bundle answers five easy questions to help readers get to know her better. romance novels; her books have appeared on Kindle Best Seller Lists. fried chicken, mashed potatoes, green beans and iced tea to drink! get some of my best ideas when I’m sewing/quilting. Night” and it was fab! is it Tyler Cash, the man everyone aboard ship thinks is Casey’s new husband?